Some of my recipes come out of desire, like my new Brownie Ice Cream Cake, and some come from necessity. These waffles were definitely the latter. A few mornings ago I only had 2 eggs, a little cheese and a little ham and 2 hungry kids and 2 adults to feed. My solution: Ham, Egg and Cheese Waffles! They really hit the spot and everyone gobbled them up! The next day I bought more eggs, cheese and bacon and made a double batch. Bacon is definitely my favorite but it’s nice to know that any prepared meat will work. These waffles literally come together in 5 minutes and would be perfect to make on the weekend, pop in the freezer and then toast in the toaster when you need a quick but filling breakfast. These wold be perfect for back to school breakfasts! Feel free to use bacon, ham, leftover sausage or even leftover hamburger meat or omit the meat all together and make savory cheese waffles to serve with 10-Minute Chili or 3-Meat Chili! Yum! How about Pizza Waffles?? Use pepperoni in the place of bacon and mozzarella for the cheese. Also add 1/2 tsp. of dry Italian seasoning to the batter instead of the pepper. You can also use about 1 link of cooked Italian sausage and omit the Italian seasoning as well. 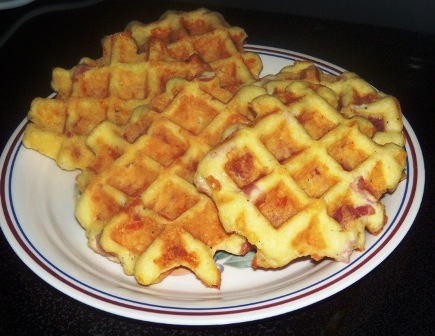 These pizza waffles are awesome dipped in Tomato Basil Soup. Also consider using these waffles as a base for your sunny side up egg… it’s a great vehicle for that yummy warm yolk! These are also great with a dollop of Daisy (sour cream) or with a little drizzle of honey! The sweet and salty is amazing! Customize these waffles to your liking and to what you have on hand. Enjoy. Preheat waffle iron to medium setting (I have THIS waffle iron and love it). While the waffle iron is heating, blend almond flour, baking powder, salt and pepper in a medium bowl. Add the remaining ingredients and stir until dough forms. Before adding batter to waffle iron, rub a little bit of butter on the bottom of the waffle iron to ensure the waffles don't stick. Then, using a 1/4 cup scoop, scoop the batter into the waffle iron (the amount will depend on the waffle iron used). Allow the waffles to cook until they are golden brown. Serve immediately. Note: If making waffles to freeze, only cook until slightly brown so that they can finish browning in the toaster later without becoming dry. Serve warm with sour cream, butter or a drizzle with your favorite syrup such as Blueberry Syrup, Blackberry Syrup, raw honey or maple syrup. can i omit the cheese?? I know it adds goodness….but Im just not a huge fan of cheese in my breakfast foods. I;m curious how it will effect the recipe. Deb, you can omit the cheese if you like. Maybe add more salt if you still want them to be savory. Enjoy. Omgosh. These are going on my must try list!!! This recipe works as pancakes too. I tried that this morning since I’m at my aunt’s house and she doesn’t have a waffle iron. We needed to feed 4 adults and a double batch made into pancakes was just right! This recipe looks good!, love your recipes!.